Deborah and Kevan got married at Birtsmorton Church and held their wedding reception at Birtsmorton court, a wonderful moated Manor House in the beautiful Worcestershire Countryside with views to the Malvern Hills. Deb and her bridesmaids has started their preparations for the wedding in the Garden House, a standalone property within the grounds of Birtsmorton Court that has living and sleeping space for your entire bridal party. 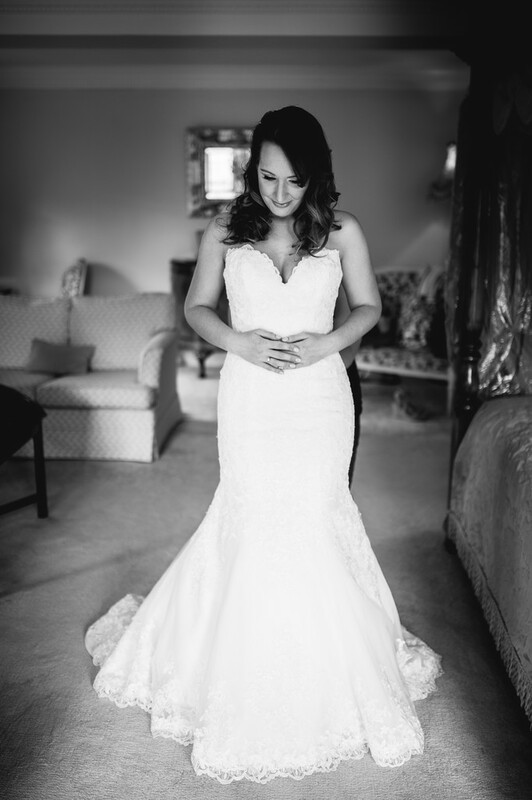 The bride's hair was done and her makeup applied here, and when she was ready, she moved to the bridal suite in one of the oldest parts of Birtsmorton Court, to get into her wedding dress. Here, it would only be a short walk to the church, and to her awaiting fiancé at the end of the aisle. The bridal suite is a stunning room, with rich, warm colours and perfect decoration, it's the perfect secluded spot to make the very final preparations for your wedding. Deborah had got into her wedding dress with the help of one of her bridesmaids, and as soon as she was decent, she called me back in to allow me to take some photos. Deb had positioned herself perfectly for photos, standing near the middle of the room, facing towards one of the large windows that looks out over the moat and the terrace below. This provided the best light possible, and made for the stunning black and white photo you see above and below. For the main image to this article, Deb was ready to go, and I'm not sure I've ever seen a bride look so excited before her wedding. 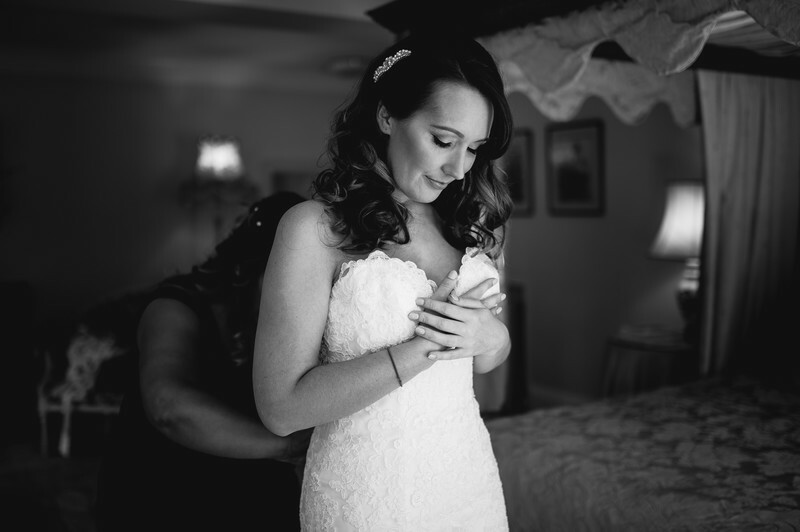 There wasn't a hint of nervousness from her, and even when she was having her wedding dress tied, she looked perfectly calm. This serenity can really be seen in the photos. I was going to take a traditional bride portrait, with Deb stood by one of the North facing windows that again provided really soft and flattering light. I took a few images before handing her her wedding bouquet. Having spoken to a lot of my clients after their weddings, a lot of my brides have said that they only really feel like a bride, or like it's their wedding day when their wedding flowers arrive, and you can see this revelation in the main photo. 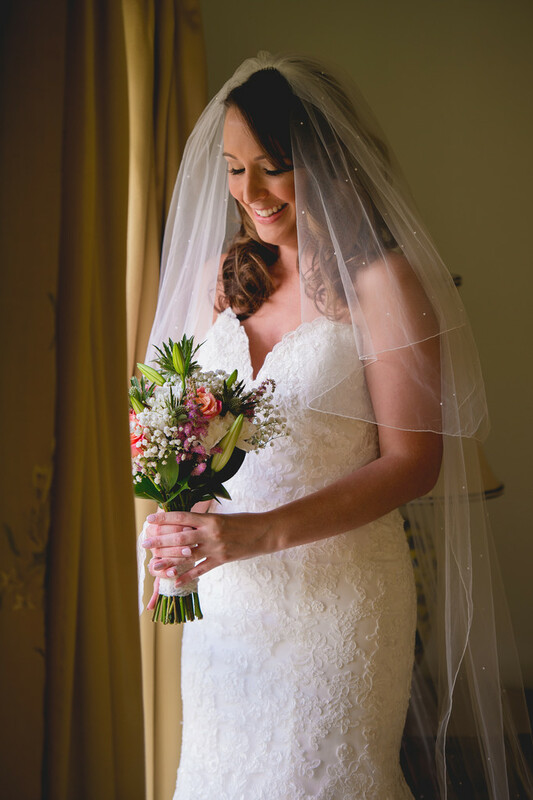 Deborah gave this huge smile whilst looking at her wedding flowers, and it makes for a wonderful photo.